Back in the days when the world first began changing too quickly, when train stations, malls, and department stores were still new and sparkling; people wanted a quick shot of fresh coffee without interrupting their metropolitan promenades. And Luigi Bezzera was happy to oblige, creating the world's first espresso machine in 1901. Today's generation of Bezzeras continue this tradition, producing capable HX espresso machines for the home. Of these, perhaps the most deserving of wide recognition is the highly refined BZ07, an espresso machine with stunningly good performance at an entry level price. 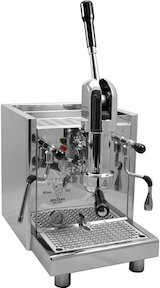 This review, however, is about an HX espresso machine with a twist: the Bezzera Strega.